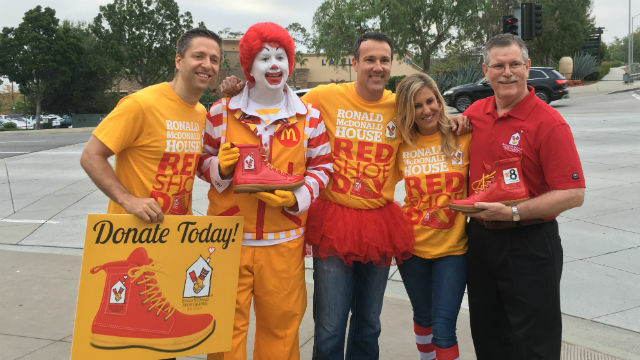 Mike Slater of KFMB (left), Ronald McDonald, Carlo Ceccetto and Ashley Jacobs of KFMB, and Chuck Day of Ronald McDonald House Charities of San Diego during the 2018 Red Shoe Day. Red Shoe Day is back and Ronald McDonald House Charities of San Diego is looking volunteers. Hundreds are needed on Thursday, June 20, to collect cash donations for the 10th annual fundraiser. Red Shoe Day is the largest volunteer-driven fundraiser for Ronald McDonald House Charities, raising nearly $250,000 in 2018. This year, Red Shoe Day volunteers will be collecting cash donations from morning commuters from 6:30 a.m. to 9:30 a.m. at more than 200 intersections throughout the county. Individuals, businesses or groups looking to support their community by volunteering can sign up at RedShoeDaySD.com. Ronald McDonald House Charities provides a range of services—including lodging, meals and emotional support—to families who have a critically-ill or injured child being treated at a San Diego-area hospital. Visit RedShoeDaySD.com to register as a volunteer or create a personal fundraising page to help support Ronald McDonald House Charities.